On Saturday, June 7, 2008 at 1:00 P.M., Christian leaders are asking that you come intercede and worship at the United States Capitol in Washington, D.C. This prayer and worship gathering will involve a "Consecration Service" where believers (like you and me!) will be dedicating the west lawn of the Capitol in preparation for The DC Awakening on October 5-11, 2008. 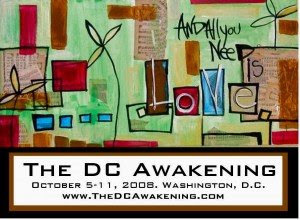 The DC Awakening is a prophetic call for the people of God to come to Washington D.C. right before our national presidential elections. Christians of all backgrounds will be gathering together on the lawn of the Capitol passionately crying out for God to send a national spiritual awakening that will impact America now and for generations to come. Believers and national leaders will be coming from all across the nation to participate in 24/7 prayer, cutting edge worship, teaching and a powerful Solemn Assembly on Yom Kippur, the Day of Atonement, repenting for our national sins on the lawn of the Capitol and in front of the Supreme Court. We prayerfully ask that join with us on Saturday, June 7th. The worship leaders will be David Bradshaw and The Awaken the Dawn Worship band and the keynote speaker will be Rev. Patrick Mahoney, Director of the Christian Defense Coalition. The events will be on the west lawn of the United States Capitol Building which is on the Washington Monument side. For more information please do not hesitate to contact us by: going to http://www.thedcawakening.com/, calling 202.547.1735, or e-mailing us at ChristianDefense[at]gmail[dot]com; we would love to hear from you. You could also help us by telling people about the event; feel free to forward this e-mail to as many people as possible! Please diligently seek God about your involvement! We hope to see you there.